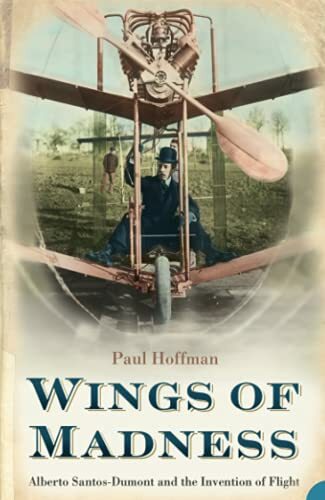 Wings of Madness by Paul Hoffman: Harper Perennial 9781841153698 Paperback - DIANE Publishing Co.
Synopsis: From the author of The Man Who Loved Only Numbers, winner of the prestigious Rhone-Poulenc science award: the history of aviation told through the extraordinary story of Alberto Santos-Dumont, the forgotten man who battled to be the first to free himself from the confines of the earth. Ask most people who flew the first aeroplane and you'll get the same response: Orville and Wilbur Wright. But ask a Brazilian the same question and you will get a different answer: Alberto Santos-Dumont, the man they have crowned the 'father of aviation'. Fearless Alberto Santos-Dumont was a slight and wiry man who built flying machines that could hold no one heavier than himself and required a daredevil dexterity to stay aloft. Never before or since has there been an aeroplane in which the pilot has had to stand up for the whole flight (he had to perfect the rumba in order to get his Bird of Prey into the air at all). Nor has anyone else had a personal flying machine - a small powered balloon that he kept tied to a lamp post outside his apartment when he was not bar-hopping, handing the reins of the airship to the doorman at his favourite night spot. His genius and charisma led him to be celebrated in Paris, London and New York: he dined with the Cartiers, the Rothschilds and the Roosevelts, and fast became the darling of the press. With his blithe faith in the future of technology, Santos-Dumont did not foresee the destructive power of his beloved machines. Yet his indomitable spirit was slowly crushed as competition grew and the skies became full of hazardous aircraft. With the dawn of World War I, he saw their potential for devastation and began to blame himself for every fatality. The guilt placed too great a weight on his mind, and as he became distracted from his aeronautical dream, family and friends began to fear for his sanity. On his last attempt to fly he glued feathers to his arms and tried to launch himself through a window in a sanatorium.